Langebaan local, Dries Millard is not shy of a challenge. 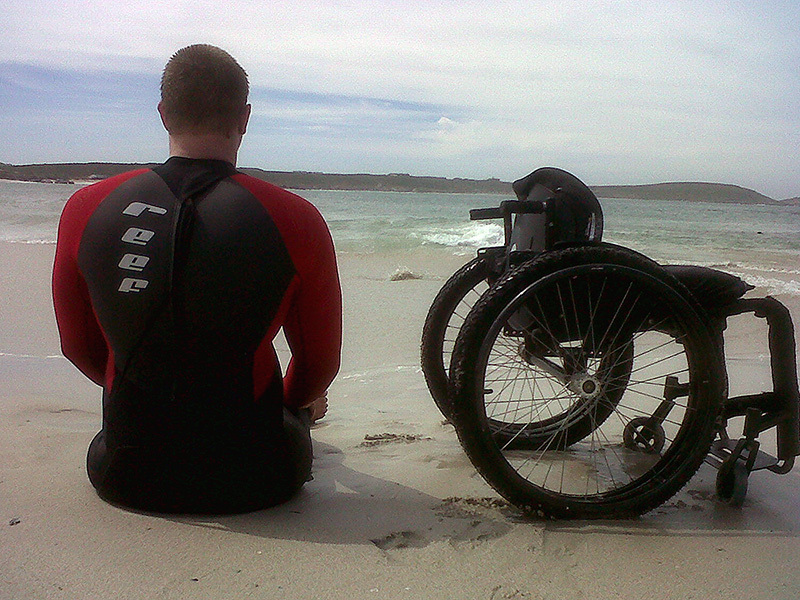 A spinal injury sustained in a road accident in 2008 meant he’d be facing life as a T8 paraplegic, but Dries wasn’t going to let that spell the end of his surfing days. 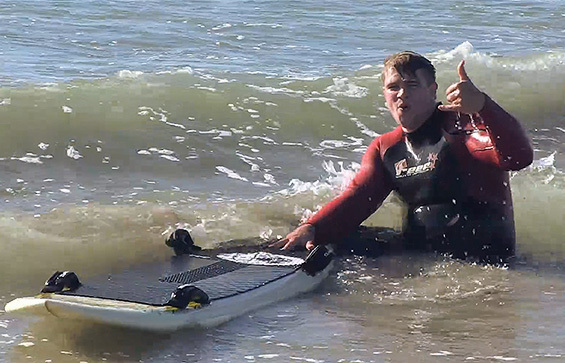 With a little help from his friends he got back in the waves, and has now been selected by Surfing South Africa to represent SA at the inaugural ISA World Adaptive Surfing Champs in San Diego between 24-27 September. Dries Millard, stoked to be in the water and ready to represent his country. Before he leaves on a jet plane to California, however, Dries will be hitting the road in preparation for the event. He has planned a 60-day tour along the SA coastline, starting on the west coast at Elands Bay in June and heading all the way up to KZN’s Sodwana Bay. 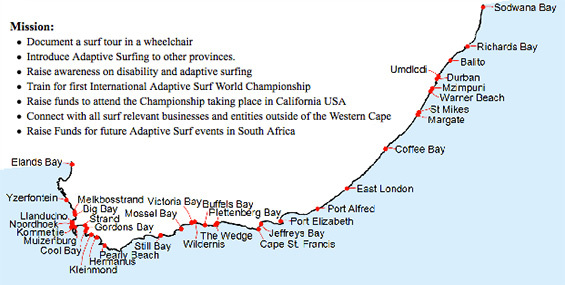 But the tour isn’t just about getting into shape and making sure he’ll be able to perform at his best at the event, it’s also to raise awareness and help promote Adaptive Surfing in other provinces. Dries’ planned route and mission objectives. Two years after his accident and having taught himself how to surf again, Dries finished a course to become a surf instructor. He then studied to be a tour guide and formed Extreme Abilities – a tour company aimed at giving people living in wheelchairs the experience of a lifetime. 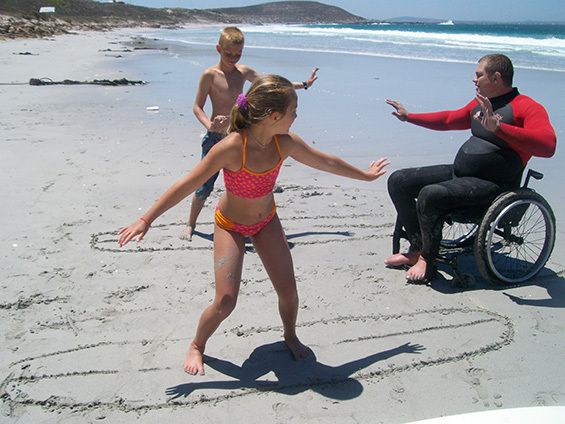 In 2011 Extreme Abilities, with the help of Surfing South Africa and a group of stoked volunteers, hosted the first annual Adapted Surfing Day, which offered individuals with disabilities the chance to explore their capabilities and experience the freedom of riding a wave. Over the past four years the Adapted Surfing Day has grown in popularity and now more than 70 participants get involved and learn the true meaning of ‘stoke’. Highlights from the third annual Extreme Abilities Adaptive Surfing Day. And as far as the future of the sport is concerned, Dries is dreaming big and hopes to surf Dungeons by next year. Technology is on his side as the Challenged Athletes Foundation (CAF) have sponsored Dries with a 7’0″ fully-gripped Wavejet board to assist with propulsion when catching some serious waves. Travelling to California doesn’t come cheap, so donations are encouraged to get Dries to San Diego and allow him a shot at claiming a world title. During his 60-day roadtrip, Dries will actively be seeking avenues for funding for not only his trip to California but also future Adapted Surfing Day events. If you’re able to assist with donations or if you want to keep updated with the progress of his road trip, contact Dries through the Extreme Abilities website or e-mail him directly on dries@extremeabilities.co.za. You can also follow @ExtremeDries on Twitter. Dries is always amped to share the stoke. Hi there,I log on to your blog named “Overcoming Odds – Dries Millard to Represent SA In California | Zigzag Magazine” regularly.Your story-telling style is witty, keep it up! And you can look our website about proxy server list.